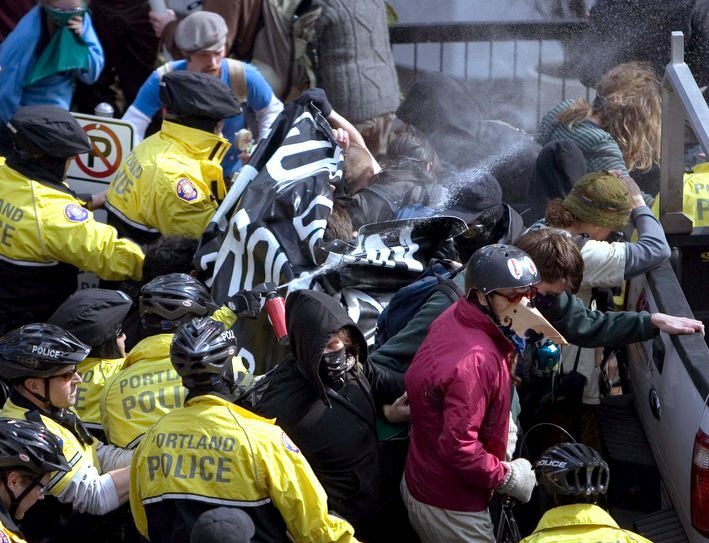 Anti-Iraq war demonstrators being pepper-sprayed by Portland police, March 19, 2008. 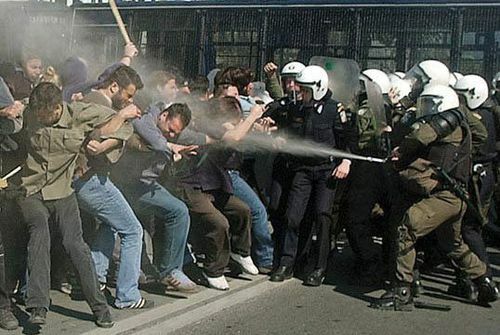 Protesters in Tehran being sprayed by watercannon, June 20, 2009. As I have been following the election protests in Iran over the last week or so, I can’t help but feel inspired by the movement’s energy. Long a polarizing global political figure, Iran now has everyone fixated on the unrest in its streets. For those of us who grew up only knowing Iran as an “evil” place with religious dictators who present death doctrines for anyone not supportive of the ruling regime, it has been an eye-opening experience seeing first-hand the cultural importance Iranians place on personal freedom. While the Ayatollah inevitably holds much of the power , this movement has brought to the surface defenders of political freedom who are literally willing to die for their cause. The burgeoning “underground” movement that led to this activist campaign is more likely representative of many Iranians’ desire to be included on the world stage, to no longer be cast as a rogue Islamic nation with leadership that does not have enough capacity for compromise to be included in international relations. While there is still substantial support for the current leadership in Iran, many of those supporters are acting only partially out of free will. Years of forced religious extremism can lead some to unknowingly enable oppression by simply going with the flow. Bob Marley said it best: “Emancipate yourselves from mental slavery, none but ourselves can free our mind”. In the case of Iran, where most people identify as being religious, the presence of Islam in politics and social policy is not the basis of this movement. Adversely, it is the misuse of Islamic principles to back up extremist policy that has Iranians openly calling for revolutionary change, as it limits Iran’s growth economically and culturally. When folks question a government’s interest in their own well-being, it leads to unrest and inevitably, institutional change. I should note that all of this is based only on my own interpretation of the news, via various media outlets. I can’t say one way or another what an Iranian person feels or thinks or why they would join a movement to protest an election. On top of it all, there are some who wonder how much difference Moussavi would actually make in the grand scheme of things, because of his ties to the same elite, religious conservatives that stand by the Ayatollah and Ahmadinejad. To me, it is not actually the politics that matter here. I am envious of what is going on right now, mostly because we here in the “land of the free” had the same opportunity in the aftermath of the 2000 Presidential election and completely missed the boat. I don’t know if anyone remembers now, it being a few wars and a few presidents ago, but that was the year that George W. Bush stole the election from Al Gore. And here we are, in 2009, asking Barack Obama to fix the economy, protect our country, reform health care, and clean up the environment for future generations – things that a Gore-Lieberman Administration might have been able to at least start doing almost a decade ago. I was only sixteen at the time, and couldn’t vote. So you could of course argue that being a teenager at the time made it impossible to understand the implications of the election. Nonetheless, there is no way I can forget the disappointment in my community – amongst teachers, amongst parents, amongst writers, amongst everyone – at literally having an election stolen from them. Being sixteen does make it hard to focus on things that matter, what with all the gossip and keggers going on around you, but it is also a time of transformation. Some of the things I learned during that period have inevitably shaped me into who I am today, even though I didn’t realize it then. One of those things, unfortunately, was an understanding that apathy is a driving force in American society. As the “hanging chads” were debated and word started to get out that Republicans had used bullying, misleading tactics to prevent minorities from voting in Florida, people got mad. Heating mad. But the mobilized protests that organized, angry activists used to hold, like Chicago in 1968 or OB in the 70’s, were just not coming to fruition. Instead, the most important “protest” of that election was a Republican scheme some call the “Brooks Brothers Riot”, a small, violent action funded by Bush’s recount committee that prevented an important recount in Miami and inevitably lead to a Supreme Court shutdown of the recount. Looking back, I wonder if maybe a little bit more public protest might have changed, well, EVERYTHING. Imagine that, instead of Bush and Cheney making up lies to bomb Iraq and steal all their oil, environmental geek Al Gore instituted federal regulations on automakers that forced hybrid technology, better gas efficiency, or **GASP** subsidized public transportation to improve availability and service for our ever-growing, sprawling metropolises. As a detached and easily influenced teenager, there was nothing going on around me that screamed “WE NEED YOUR VOICE”. In contrast, a sixteen year old living in Tehran is getting an education in the power of free will, the institutions that limit that freedom by force, and the power of media as a voice for oppressed people. I didn’t get that kind of education in 2000. Instead, I had to seek it out during my upperclassmen college years – after wasting a few semesters sleeping in and drinking cheap beer. Though there was a notable youth movement that injected much needed energy into electing President Obama, my generation seems to be apathetic, spoiled, and mostly apolitical. The activism of old has transformed into a quasi-nihilism, where being “politically active” is cliché and electing the first black President is “good enough”. But at a time when unemployment is high and everything seems to be in “wait and see” mode, where is the anger, outrage, and mistrust that typifies people living in an unstable and ever-changing world? We have a lot of change left before this ship can be righted, and as evidenced by the past few months, we can’t even trust President Obama to follow through on all his promises. After all, he is a politician. If you are the type of person who is glued to the news about Iran, but can’t figure out why, you may be afflicted with apathy. Even as someone who complains about a lack of political interest by people my age, I can’t tell how unrest in Iran will affect me directly. There is no guarantee that these events will change diplomatic relations between Iran and the rest of the world, nor is there a guarantee that the people who were murdered at the hands of thugs loyal to the ruling regime will have died for a winning cause. But by following and supporting facilitators of change on the street level, you are educating yourself on the strength of protest and the power of free will. One can only hope that if in the future we need to call upon that strength ourselves – to stand up and defend free will by taking to the streets and demanding change – that we can look back on these agents of change and embody their fighting spirit in a movement of our own. One of my personal heroes Abbie Hoffman once wrote: “Revolution is not something fixed in idealogy, nor is it something fashioned to a particular decade. It is a perpetual process embedded in the human spirit”. While I find myself part of an apathetic generation spoiled by decades of emptiness and consumerism, I can’t help but be optimistic for the future. We can look to our President as an example of someone rising to the highest office in America from humble beginnings, and to the streets of Iran for inspiration in fighting for our personal beliefs. Let us not be complacent at a time of transition; instead, we should be basking in the opportunity to be agents of lasting change. We’ve all been moved by the heroic struggle of the Iranian people against a government that refused to count their votes – and by the brutal murder of Neda Agha-Soltan. Here in the U.S., we voted twice to remove the warmongering Republican Congress and President. But we must still struggle to end their wars and to hold them accountable for their war crimes, including torture. So let’s take our inspiration from the Iranian people and renew our progressive activism here in the U.S. today. U.S. bombing in Afghanistan and Pakistan has killed hundreds of civilians and created hundreds of thousands of refugees. Watch the powerful videos at RethinkAfghanistan. Yet Congress is set to authorize $550 billion in military spending with an additional $130 billion to fight the wars in Iraq and Afghanistan – more than George W. Bush ever requested. Rep. Jim McGovern (D-MA) wants an exit strategy from Afghanistan and his bill ( H.R. 2404 ) has 89 Congressional co-sponsors. On Wednesday, he will propose it as an amendment to the war funding bill – but he needs our help. Also call your Representative today at (202) 224-3121 to co-sponsor Rep. McGovern’s Afghanistan Exit Strategy bill H.R. 2404, and to vote for Rep. McGovern’s amendment to the Defense Authorization bill (H.R. 2647). A large coalition of human rights groups will hold rallies and marches in major U.S. cities, including a rally in Washington, D.C.’s John Marshall P ark at 11 a.m. followed by a noon march to the Justice Department where some participants will risk arrest in nonviolent protest if a special prosecutor for torture is not appointed. In Pasadena at 12 p.m. PT citizens will submit a formal judicial misconduct complaint against 9th Circuit Judge Jay Bybee, former Assistant Attorney General. Let’s bring the Twitter Revolution to the USA! I am confused by the support for the rebellion in Iran from a progressive community that is presented here in the OB Rag. In Lane Tobias’ article there seems a heartfelt recognition of the events recently taking place in Iran as democratic but there remains many disturbing and unaddressed questions about foreign governments outside Iran as having had a direct role in fomenting these protests. None of this is being addressed by you Lane Tobias. Why? The recent article by Foreign Policy Journal editor, Jeremy Hammond called seems to have documented a formidable amount of evidence that this has been a long standing project to disrupt Iran’s theocratic government by multiple governments. Maybe you should give it a read Lane and see if this does not shine a different light on events we are now seeing portrayed as a authentic revolution. Is it any wonder that we never have peace when we are such a gullible people. Robert, there is some evidence to the point you’re making, but there’s a lot of evidence that this is a genuine reform movement that stands for democracy, women’s rights, and a multi-centered government, not just a theocratic one. It is true that this is perhaps what some foreign governments wish to see, but it is also true that Iranians have been striving for these principles since the early 1950s. Our CIA overthrew a democratically-elected popular prime minister and installed the Shah, a brutal dictator. The Shah was the cause of the 1979 Revolution, which had a huge democratic flavor to it. Just because our CIA and foreign governments back a movement, does not mean that we should oppose it. The enemy of our enemy is not necessarily our friend. It is a little disingenuous of you criticize Lane when he was voicing a significant heartfelt perspective: Americans being inspired by the bravery shown by Iranians, and the lack of such bravery by Americans when our own election was stolen. Why not address that – which is the point of his post. Lane, a very sincere and thoughtful perspective. Here’s a slightly different view. I’ve had some enlightening chats with Iranian-American coworkers in the past. Many Iranian-Americans are here because they enjoy a level of freedom and democracy that they could only dream of in Iran. Many people living in Iran learn about American ways from their family and friends who live here. They want the same freedom and democracy in their own country, but the religious leaders won’t allow it. We just recently saw Iranian people take the opportunity to reform their government, only be slammed back down in fear. But the desire is still there. It seems like Americans have been leading by example without knowing it. Not the US government that can’t stop meddling in foreign affairs, but the American people who take freedom for granted every day. Iranian people want that same kind of freedom, too. They see it over here, they know it is possible. We haven’t heard the end of this. I agree with Frank, there is certainly some influence from other governments here – if not directly, than indirectly through public comments from elected officials, like those of President Obama in the last few days. I actually deleted a whole line of paragraphs that had to do with this fact, because it was off topic of my post. I am voicing the opinion of someone who is jealous of the level of freedom that these protestors are asking for in the face of an election that they believe was stolen from them. In 2000, an election was stolen here. And my point is that nobody came close to demonstrating their displeasure on that level. Wireless – I agree that our daily freedom is a model for the rest of the world….even if we have slowly been losing some a little at a time over the last 10 years or so. Frank Gormlie and wireless Mike, their is indeed a demonstration for a different society in Iran with these recent protests. Issues that American Progressives can relate to such as; rights of women, freedom of speech and assembly. Their is also a grave danger for Progressives to be manipulated by foreign policy aims for the region that extend beyond those of the protesters. Do we understand that in fomenting disruption of a sovereign government we are promoting its overthrow and to what ends? There is a global energy war taking place in the entire region. It involves the interests of China, Russia, Great Britain, and the United States and that is what we see playing out with the Iranian situation, the Afghan and Iraqi occupations and the now escalating war into Pakistan. The individual rights issues of Iranian citizens are a cynical device for the power stuggle that we are witnessing. In encouraging Iranians who desire a regime change to a secular government we have put them up to be in harms way. They are invoking Democracy as Lane is and others on this web blog which is commendable but are these really the motives of the U.S. Government? What I hear in all these comments is a vicarious desire for liberation played out through another peoples struggles. Mike speaks of the freedoms we enjoy inside the U.S. but this is also the freedom for corporations to determine our prospects as citizens. Where are our jobs, our affordable healthcare, rights to marriage if we are gay? What is it really mean to live in freedom and who benefits? Does that include the freedom for Oil companies to play with peoples lives and hopes? We need to demand freedom from our own people at home before playing with other peoples dreams that are likely to result in another tragedy for the Iranian people. When the media turns its eyes away and financial interests accomplish their goals where will we be for the Iranian people? Lets go into a future where we demand democracy for all with our eyes open to whats really happening. And lets not be deceived anylonger by governments and media that has taught us well not to put our faith for our futures in their hands. i think you’re preaching to the choir, so to speak. What a great piece Lane, and the thread that follows is very thought provoking too. I’d like to address the apathy after the 2000 election and offer up this; If Clinton hadn’t been sidetracked by his inability to keep his pants on, I don’t think ‘Lil Bush would of (or could of) stole the election. People were really down on the Dems at that point so it was hard for anyone in that party to really circle the wagons and fight back. On the other hand, if we didn’t have 8 years of the worst President since (fill in name here, I’m going to say, Reagan) we wouldn’t have gotten to the point to where President Obama was elected, which to me seems truly revolutionary. You have to know what bad is to understand what good can be, but sometimes folks seem to forget that when there are so many other things vying for our attention. Lane – I’m developing a theory on why the American progressive left did not respond like the Iranians did to our stolen election in 2000. There’s a strong activist sector of the US left that does not get involved in elections – ‘its too reformist’. That sector was the sector that could have led street demonstrations in major cities once it looked like the election in 2000 was going to be manipulated. Instead, that sector had geared up and had involved itself in the WTO – World Trade Organization -protests in Seattle in 1999. The response by the authorities there was somewhat overwhelming. The end result – Bush for 8 years. Okay, just a budding theory. I’d love to hear from others on this. OB Joe, i definitely agree with you on this…when I was in college, the 2004 election brought about a whole new movement on the Cornell and Ithaca College campuses in a supposed liberal haven – young, vocal, active republicans. Unfortunately, their support was not met with the same rigor from the left, as most young liberals were not enamored by ANY means with John Kerry (myself very much included). So I do know a number of people who, if they even DID vote in their first possible Presidential election, went with another candidate. People were apathetic, but moreso, unenthused. It was similar to what you describe above in that the end result was that people didn’t vote, and didn’t seem to care when Bush got re-elected. So there are young people who seem to believe elections dont matter too, although they may have a little more faith after 2008…Nonetheless, I agree with you on a number of levels, and think that probably had a lot to do with the lack of activist demonstration from Gore supporters in 2000.